Last night's Golden Globes had a few dresses that blew me away and were certainly worthy of the buzz of the red carpet but a whole lot of others failed to impress me. Amy Adams in a two-tone red Valentino dress and Naomi Watts in a shimmery Tom Ford number were my best dressed votes for the night with their incredible One of a Kind Red Carpet Style. There were others like Margot Robbie in Gucci, Julianna Margulies in Andrew Gn, Olivia Wilde in Gucci and Kate Mara in a silver J. Mendel that also impressed me and are worthy of honorary mentions. Today Diet Dr Pepper has asked me to share my favorite trends from the red carpet. The deep V necklines, fifty shades of red, and metallics all called my attention and made me want to bust into my own closet in search of my favorite red carpet inspired pieces. 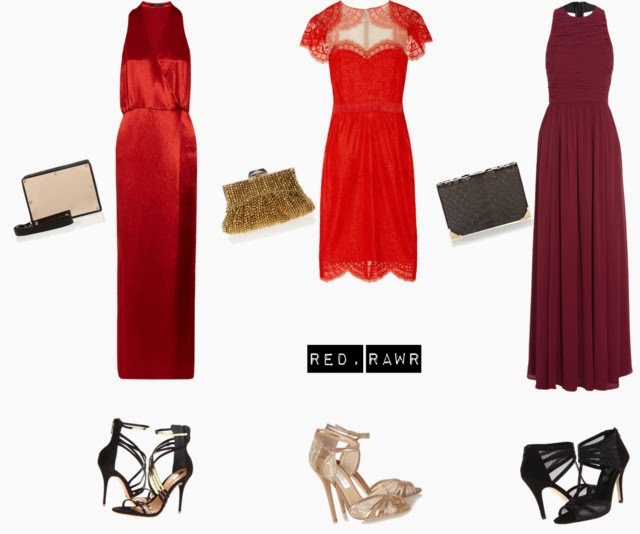 How would you incorporate these red carpet styles into your very own One of a Kind look? After doing a little online browsing I found three red dresses that are absolutely red carpet worthy and, paired with some simple accessories, would be worthy of a best dressed title wherever you go. p.s. I guess I wasn't off point when I wore this deep red strapless BCBGMaxazria gown to our friend's wedding a few weeks ago! absolutely loved margot robbie's dress and jewelry, she looked amazing! Amy looked amazing! And Julianna and Naomi looked nice too. loved all of these - also loved Olivia Wilde in glittering green. She's never looked better, even with her cute baby bump! This is a great look on you :) Love love the necklace. I've featured my favorites from last night on my blog today! I love Amy Adams dress! It might have been my favorite!